I ADORE our local government primary school. ADORE. A.D.O.R.E. Oscar was in a mainstream class there for four years. He was included, he was engaged, he was safe and he was loved. When he started high school this year two of his classmates rang to see how he was settling in and two others asked me on Facebook which was, quite frankly, unsettling* but I appreciate the sentiment. We moved Felix from the school we had sent him to (to have some of his own space and to not be defined by his special needs sibling) and on.his.first.day as he walked from where they lined up to the assembly hall he whispered to me, ‘it’s really good’. I mean COME ON – they’ve gotta work harder to win over a (then) fourth grader surely. 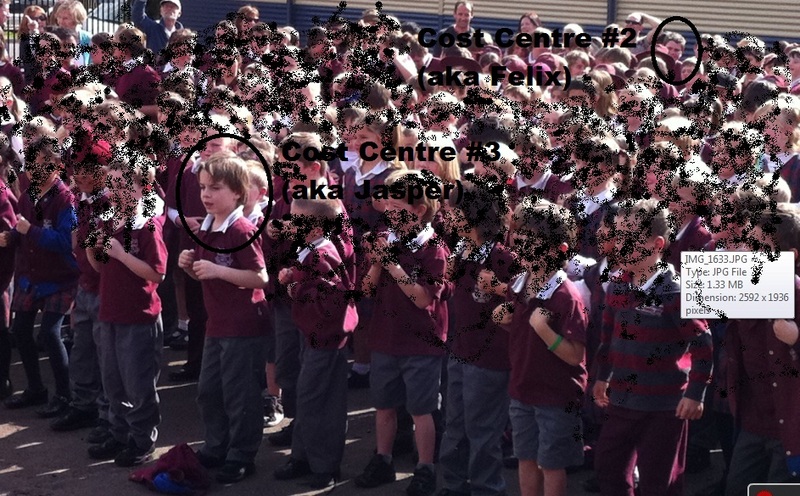 Jasper started this year and apart from the LUDICROUS expectations on kindy kids (and their teachers) he took to it like a duck to water. I mean seriously people, I remember when kindy was about colouring in, painting, craft, learning pencil grip, which colour rod represented what number, craft, how to tie your laces, about 30 sight words and basically trying not to pee your pants. Oh, and craft. Jasper was up to 30 sight words by Week 2. After an ASSESSMENT the week BEFORE school started. Last term his beautiful (and incredibly good) teacher expressed her concern he wasn’t reading at the stage she thought he’d be at. I – of course – initially panicked and then told my head “HE’S FIVE”. FFS. Grover will start there in 2013. If he lives that long. Or he hasn’t been sent to juvie hall. It’s a small school – only 300 kids. There is a very strong sense of community. A remarkably talented and diverse and dedicated teaching body. A zero acceptance policy on bullying (that is followed through thoroughly). It has a very strong pro-inclusion policy for kids with additional needs. 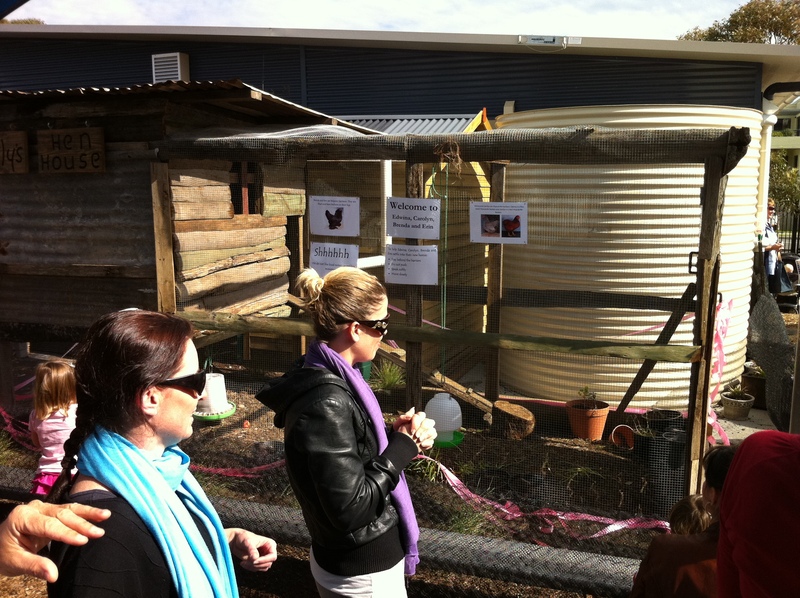 It has an amazing environmental program which includes water tanks, solar panels, several vegetable gardens, a massive worm farm and now, well now it has a chook house. Today was it’s annual open day – you know the drill – you sit in the hall, craning your neck to see your kid (not mine) perform in the band, or recorder group or choir. You listen to the band play a medley of Queen songs with someone slightly off beat, a clarinet a bit flat, a saxophone squeak and a drummer too loud (is there any other sort). Then the choir sings a medley of Peter Allen tunes and you try to count the girls who do drama. And dance. You know, the overly-animated ones with their hair really pulled back off their face. So you can really see how much they understand the song through their facial movements. Then there’s a presentation by which time your arse has atrophied to the seat and you’ve lost count of the number of protesting smaller siblings that have been dragged from proceeding only to wail louder and stronger from just outside the door. Good times. God I love this school. * I have recently discovered teenagers read this which is both alarming and hilarious. I mean, what on earth can a mother of four boys say that is interesting let alone entertaining to a teenager? And also – the swearing. Whoops.